Nina Sankovitch’s eldest sister Anne-Marie died at the age of forty-six. In response to her sister’s death, and her desire to heal her loss, Nina decided to devote a year of her life to reading a book a day. 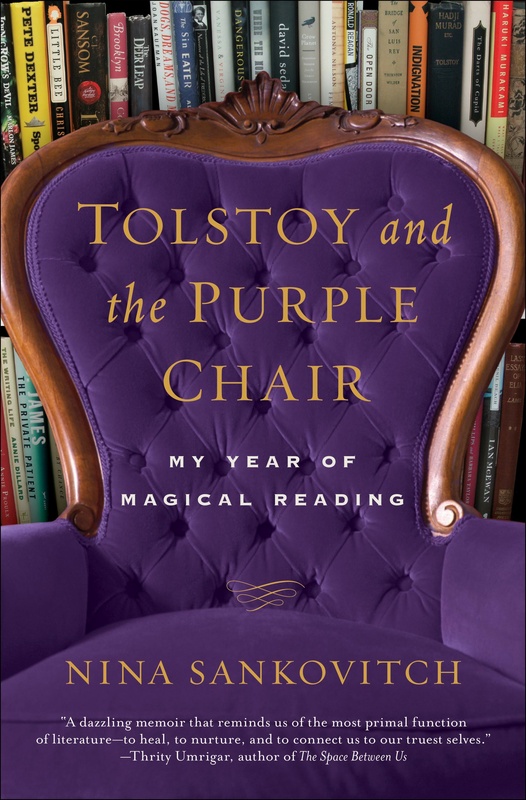 Tolstoy and the Purple Chair is a beautifully written memoir of Nina’s healing journey. Peppered with countless quotes and words of wisdom from many of the books and authors Nina filled her days and nights with during her year’s sojourn, I highly recommend this book. It is a story of life, loss, love, and mostly, one about the way in which literature connects the human community and helps us to make sense of the world in which we live. A year of reading books would be a dream come true for me. I’d even be grateful with a fortnight, a satchel of good books, and a comfortable chair by the sea. Looking over the long list of books I hope to read in my lifetime, I felt a deep affinity with the author who, like myself, has a lifelong passion for reading. There have been many times when I have asked myself what motivates me to read so many books. I question the value of them and wonder what compels me. I think Nina Sankovitch’s book provided me with the missing piece of the puzzle. I quote, “The purpose of great literature is to reveal what is hidden and to illuminate what is in darkness.” Thank you Nina for your beacon of light. This entry was posted in Uncategorized and tagged Books, Connecticut, Evanston, healing, Nina Sankovitch, Read All Day, reading, Tolstoy, Tolstoy and the Purple Chair, WWII. Bookmark the permalink. Hi Diane, oh yes this really does sound like a wonderful book for book lovers and I’m definitely going to track down a copy. I couldn’t think of anything nicer than having the time to read a book a day (and blog about it!) I’m in that summer slump time at the moment, my reading has become quite scattered – this sounds just the thing to help with getting back on track. Glad you enjoyed it so much and thanks for the recommendation. Fascinating! All-round great blog, by the way.